The AFC Wild Card playoff game at San Diego on January 8, 2005 featured the San Diego Chargers hosting the New York Jets. The Chargers had won nine of their last ten games to finish atop the AFC West with a 12-4 record while New York lost three of its last four contests to end up in second place in the AFC East at 10-6 and needed help to get into the playoffs (a Buffalo loss in the final week). San Diego, coached by Marty Schottenheimer, had turned around very quickly from a 4-12 record in 2003 and was in the postseason for the first time since 1995. QB Drew Brees had dramatically improved in his fourth year while TE Antonio Gates emerged as an outstanding receiver. RB LaDainian Tomlinson, also in his fourth season, was already established as one of the league’s best all-around backs. The defense had improved as well under the tutelage of coordinator Wade Phillips. The Jets, coached by Herman Edwards, had the league’s leading rusher in 31-year-old RB Curtis Martin (1697 yards). QB Chad Pennington (pictured at top) was smart, efficient, and a good leader, but was troubled by a torn rotator cuff (he would have surgery in the offseason). Rookie MLB Jonathan Vilma was a good addition to the defense, but star DE John Abraham had gone down with a knee injury late in the season. There were 67,536 fans in attendance at Qualcomm Stadium for the Saturday night game with rain falling. The Jets took the opening kickoff and drove 57 yards in 11 plays. Chad Pennington converted a third-and-nine situation with a completion to WR Santana Moss for 16 yards and, later facing third-and-eight at his own 45, threw to WR Justin McCareins, also for 16 yards. A 16-yard run by RB LaMont Jordan got the ball to the San Diego 23 and the series finally stalled at the 14. However, the visitors came up empty when Doug Brien missed a 33-yard field goal attempt. The Chargers were unable to get anything going on offense and the teams traded punts until San Diego started a 13-play, 88-yard drive that extended into the second quarter. LaDainian Tomlinson ran for 13 yards on the first two plays, on the way to seven attempts for 39 yards for the series, and Drew Brees completed all five of his passes, the last to WR Keenan McCardell, who made an outstanding catch for a 26-yard touchdown that was initially ruled incomplete but was overturned on replay. Nate Kaeding added the extra point to give the Chargers a 7-0 lead. The teams again exchanged punts until the Jets, helped by a 15-yard unsportsmanlike conduct penalty on Coach Schottenheimer for running onto the field to protest the lack of a roughing-the-kicker flag on the punt, put together a five-play, 52-yard possession that included a Pennington pass to McCareins that picked up 21 yards to the San Diego 15. Two plays later, Pennington connected with TE Anthony Becht for a 13-yard TD and, with Brien adding the extra point, the game was tied with less than three minutes remaining in the first half. The Chargers again drove into New York territory as Brees completed passes of nine yards to McCardell, 16 yards to WR Eric Parker, and 15 yards to Antonio Gates. But after advancing to the 37, a Brees pass was intercepted by SS Reggie Tongue. Thus ended the last scoring opportunity of the half, and the game remained tied at the midpoint. Following a San Diego punt that ended the first series of the third quarter, the Jets moved 75 yards in five plays to take the lead. Pennington completed passes to McCareins of 11 and 10 yards, and then connected with Moss, who outran FS Jerry Wilson and CB Quentin Jammer for a 47-yard touchdown. Brien added the PAT and New York was up by 14-7. The Chargers reached their 43 on the ensuing series before punting, and the Jets again put together a scoring drive of eight plays and 42 yards. The highlight was a Pennington screen pass to Curtis Martin that picked up 23 yards to the San Diego 31. However, a penalty backed the Jets up and they ultimately had to settle for a 42-yard field goal by Brien, which bounced off the crossbar before going through, but they now led by a ten-point margin. San Diego had the ball heading into the fourth quarter, on the way to a 54-yard possession in 12 plays. Most were passes by Brees, as he hit Parker twice for 14 and 12 yards, and Tomlinson for a total of 15 yards. Kaeding kicked a 35-yard field goal to make it a 17-10 game. The Jets mounted a long drive in response, with Pennington chipping away on short passes and a five-yard penalty on the Chargers for having 12 men on the field allowing New York to convert a fourth-and-three play at the San Diego 40. The visitors reached the 34 before punting, passing up a long field goal attempt, having used up over five-and-a-half minutes. The Chargers took over at their 20 with 4:46 remaining in regulation. It looked bad for them when Brees was sacked on the first play for a six-yard loss. However, he threw to Gates for 21 yards and a first down and then, after tossing an incomplete pass, connected with Gates again for a 44-yard gain to the New York 21. Tomlinson ran for 12 yards to give the Chargers first-and-goal at the nine. Tomlinson carried again, for a yard, and Brees went seven yards up the middle to the one. On third down, Tomlinson lost a yard and, with the clock down to 24 seconds, it was a fourth-and-two situation. Under hot pursuit, Brees faded back 20 yards before launching a pass that was knocked down in the end zone, but LB Eric Barton was penalized for roughing the passer when he hit the quarterback in the head with his right forearm. 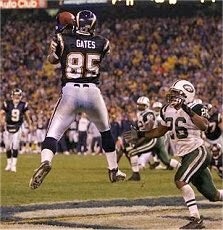 With a first down and a half-the-distance penalty on New York that moved the ball to the one, Brees then tossed to Gates for a touchdown (pictured below). Kaeding’s vital extra point was good and the game headed into overtime with the score tied at 17-17. San Diego had the first possession but punted, and the Jets went three-and-out and kicked it back. Starting at their 30, the Chargers put together a 14-play, 48-yard drive. Brees threw to Parker for eight yards in a third-and-five situation and converted another third down near midfield with a three yard carry. A pass to Tomlinson gained 10 yards to the New York 33 and Tomlinson then ran around left end for a nine-yard gain. With the ball inside the New York 25, the Chargers played conservatively to line up for a field goal, and Kaeding came on to try from 40 yards. However, the kick was wide to the right and the game continued. Following a four-yard carry by Martin, Pennington threw to Moss for 18 yards and, two plays later, he connected with McCareins for 11 yards to the San Diego 34. Jordan ran for 19 yards and now it was time for the visitors to maneuver for a field goal. Brien’s kick was good from 28 yards out and the Jets came away with a 20-17 win. The Chargers had the edge in total yards (408 to 396) and first downs (24 to 20). Each team recorded two sacks apiece and there was just one turnover, which was by San Diego. The Chargers were also penalized nine times, at a cost of 75 yards, to eight penalties for 49 yards on New York. 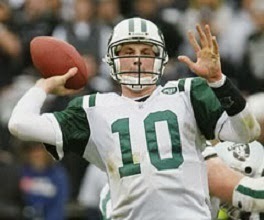 Chad Pennington completed 23 of 33 passes for 279 yards and two touchdowns with no interceptions. Curtis Martin ran for 66 yards on 18 carries and caught four passes for 47 yards. LaMont Jordan contributed 50 yards on 7 rushing attempts. Justin McCareins had 8 pass receptions for 87 yards while Santana Moss gained an even 100 yards on his four catches that included the one long TD. 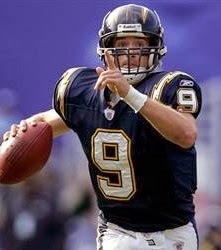 For the Chargers, Drew Brees (pictured at right) was successful on 31 of 42 throws for 319 yards and two TDs with one interception. LaDainian Tomlinson rushed for 80 yards on 26 attempts and had 9 pass receptions for another 53 yards. Eric Parker also had 9 catches, for a team-leading 93 yards, and Antonio Gates compiled 89 yards on 6 receptions that included a score. The Jets lost to Pittsburgh in the Divisional playoff round, again in overtime and on the other end of an identical 20-17 score. Doug Brien, who kicked the winning field goal against the Chargers, was the goat against the Steelers, missing two field goal attempts in the final minutes that could have won the game. New York fell to 4-12 in ’05, leading to the dismissal of Coach Edwards, and returned to the postseason in 2006 under a new head coach, Eric Mangini. As for San Diego, it was the fifth straight playoff loss for Coach Marty Schottenheimer, an unfortunate blot on an otherwise solid coaching career. The Chargers went 9-7 in 2005 and placed third in the AFC West, but bounced back in 2006 with a conference-best 14-2 record. They lost their first postseason contest once again, this time at the Divisional level, and Schottenheimer was let go.